The month of November may be a time to start your holiday shopping and decide which gifts to buy for your loved ones. However, you might be more interested in giving the gift of life this holiday season. If you are in good health, you can give the gift of life by volunteering to be placed in a Registry coordinated by The National Marrow Donor Program. Patients can only be helped if there are donors available to help them, and the more donors, the better. Donors offer patients the gift of a longer and healthier life, and it’s something you will feel great about for many years to come. Medical conditions can happen at any age, young or old. 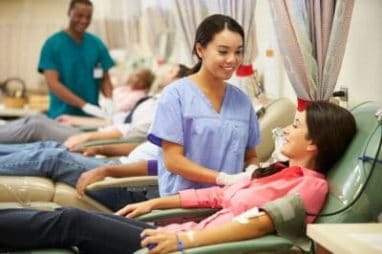 People of all ages, races, and genders are in need of help, and National Marrow Awareness Month is meant to inform people about the importance of becoming a donor. When a person has a life-threatening disease such as leukemia, lymphoma, or certain types of anemia, they may be in need of a bone marrow transplant. This can happen when a patient is not responding to their current treatments. Your generous bone marrow transplant can provide a patient with hope and strength during a difficult time. Currently, there are more than 5 million potential donors in the National Bone Marrow Donor Program. The registry keeps track of all three sources of stem cells such as marrow, peripheral blood, and umbilical cord blood. It’s important to have donors of all racial and ethnic groups. If you are interested in becoming a donor and joining the Registry, you are making a commitment to be a potential donor for any patient that your tissues should match. You will need to respond quickly if you are contacted as a match. You will be listed in the Registry until you are 61 years of age, unless you asked to be removed before then. You will also need to pay for the cost of the initial blood sample, which is generally about $100. You will also be asked to inform the National Bone Marrow Program of any changes in your health, or even an address change. A patient’s life could depend on you, so it is important that all registered donors be reliable. If you are between the ages of 18 and 60 and have made the decision to be added to the Registry, your next step is to contact the National Bone Marrow Program and go in for your blood samples. Your tissue type will be identified and your information will be entered into the Registry. If you cannot donate but would still like to help, consider making a financial contribution through The Bone Marrow Foundation. You can also donate umbilical cord blood after a baby is born. Aside from becoming a tissue donor during National Marrow Awareness Month, you can help to grant the wish of a local child with a critical illness by donating a car to Wheels For Wishes, benefiting Make-A-Wish. Make-A-Wish helps to grant the wishes of children between the ages of 2 ½ and 18 who are battling a critical illness. Children with leukemia, lymphoma and other critical illnesses may not only be waiting for a donor to match their tissue types, but they are also wishing for an opportunity to do something magical during this difficult time in their lives. When you donate a car to Wheels For Wishes, you can play a part in granting a wish for a child who wishes to take a dream vacation, go on a magical shopping spree, or meet their favorite sports player or musician. Wishes are only limited to a child’s imagination. Just ask yourself, what would you have wished for as a child? Make a difference during National Marrow Awareness Month and donate a car by calling 1-877-431-9474 or filling out an easy online vehicle donation form. When you donate a car before 11:59 p.m. on Dec. 31, your donation still counts for the 2014 tax year! You get a great tax deduction when you donate a car, plus free pick-up or towing of your vehicle, whether it runs or not. Donate your unwanted vehicle today and let it grant a wish for a child in your community!